The Three Celestial Protectors (Immaculate Chilin, Fortune Pi Yao and Fierce Fu Dog) is one of the most popular remedies for countering the 3-Killings affliction. These divine creatures can effectively arrest the "three robbers" energy (3-Killings). The Immaculate Chilin is said to protect loss of favorable connections, the Fortune Pi Yao to protect loss of money and the Fu Dog to protect against bloodshed. Stunningly designed in ultra fine craftmanship, this superb quality brass pieces sparkle in fresh and vibrant gold which exert quality metal energy where classical masters claim to be a necessity for fighting the 3-Killings. 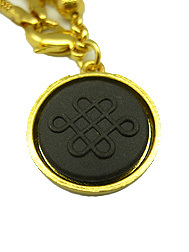 Inspired by the need to activate its true potential and power, a shy energy infused tag is hidden under an exquisite pendant of the mystic knot. Careful attention has been paid to every detail. Beautiful and dainty, it serves as a neat, tidy and classy looking hanging for modern homes. The remedy will protect you from legal problems, violences, lawsuits, gossips, scandals, backstabbings, obstacles, prevent accidents/losses, enhance good fortune and bring in good luck. Apart from protecting you, it is also able to axe away your opponents, enemies, competitors or evil counterparts. 2. The horse, rooster, rabbit and rat directions are the four cardinal directions that take turns to be afflicted by 3-Killings from year to year. Therefore, these zodiacs in specific are more prone to legal issues, violence, robbery, fatality and unstable career. In 2017, the east is "sitting" on the 3-Killings. Those who are born under the zodiac Rabbit will potentially have to face legal battles. The nearby signs of Tiger and Dragon will also be experiencing the same impact. 3. The direct opposite direction of "sitting" is the "facing" direction. Although facing the 3-Killings may not result in severe misfortune, but they should be overcome as well to totally eliminate the negative impact. In 2017, the west is the facing direction. Therefore, the Rooster sign will need to overcome the wrath of the 3-Killings as well. The Fu Dog is actually a lion, popularly known as defender of law and protector of buildings. The Fu Dog provides ultimate protection, wards of evil spirits and harmful people, nourishes chi that enters homes, brings in happy blessings and dissolves bad chi from neighbourly formations when placed in front of your main door at either sides or raised high up on both sides of your main gate.